Dubbed as “One of the most beautiful cave in Viet Nam” – Phong Nha Cave is the most famous natural beauty in Viet Nam. Phong Nha Cave is in the system of Phong Nha – Ke Bang National Park and it is the most beautiful cave in Quang Binh and Viet Nam. There are many colorful stalactites which are attracted the curiosity of millions of visitors every year. Phong Nha – Ke Bang National Park is located in Bo Trach and Minh Hoa districts of Quang Binh province. It has a system of limestone mountains up to 200,000 hectares. Phong Nha – Ke Bang features a large cave system: 300 caves and imposing limestone formations. Carxter ectonics of Phong Nha – Ke Bang has a life expectancy of 400 million years and it is Asia’s oldest Carxter ectonics. A special thing is the caves in Phong Nha Viet Nam that are not uniform, each cave has different tectonics and stalactites systems. Not only Phong Nha cave, Phong Nha – Ke Bang also has many famous and beautiful caves which are well-known all over the world such as Tien Son cave, Thien Duong cave, Son Doong cave … The cave system is also highly appreciated by the vast, dense river, high rainfall, very pure emulsion with no impurities with high CaHCO3 content, many large stalactites with the height of 80 meters.Every year, the cave system is raised and make it different from other caves in the world. At present, there are many caves still undiscovered by the terrain in this place is very rugged and dangerous. Phong Nha is located 50 kilometers from Dong Hoi city, Quang Binh province. 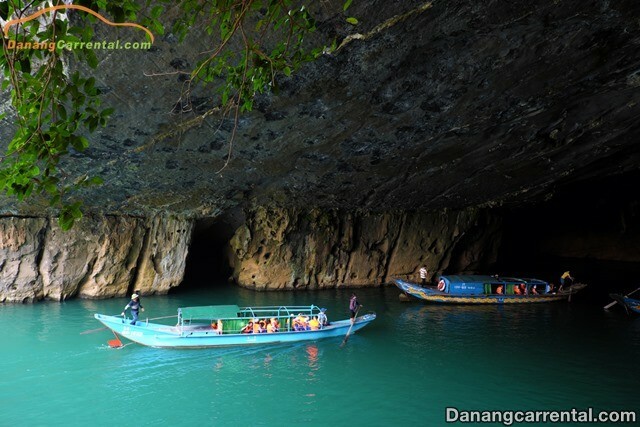 This cave belongs to Bo Trach district, Quang Binh province. Phong Nha has many branches, its total length and branches are up to 20 kilometers. The gate of Phong Nha cave is about 20 meters wide, about 10 meters high. Above the cave is rocks and stalagmites jutting out, there is also a river flowing through the cave. Phong Nha cave system has a total length of about 44.5 kilometers in which visitors can only discover about 1.5 kilometers length of the cave to ensure safety. Phong Nha includes many small caves, including Toi cave, Cha An cave, Thung cave, En cave, Khe Tien cave, … tourists must go by boat if they want to discover here. The scenery outside the cave is very wild and majestic, with the beauty of mountains and rivers which attracts to a lot of visitors when coming here. 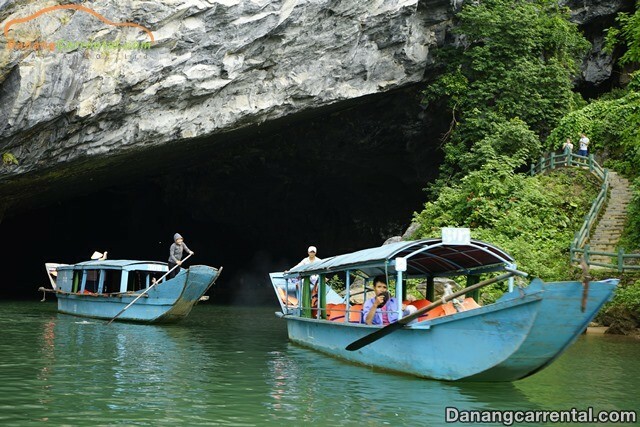 The entrance to Phong Nha cave is quite dark, so the passenger boats must turn off the mechanical device and sail the boats slowly into the cave. For the evening, guests are equipped with flashlights, life jackets to ensure safety. Sunlight will be replaced by the light of the stalactites rolling down. Here you can see a large system of different stalactites. Many special stalactites are given a name such as Lion, Unicorn, Palace, Statue of Buddha, etc. Some of the stalactites are still in the process of weathering, the droplets from the top drop down like rain. Visitors can stop on the large stone to visit and take photos. 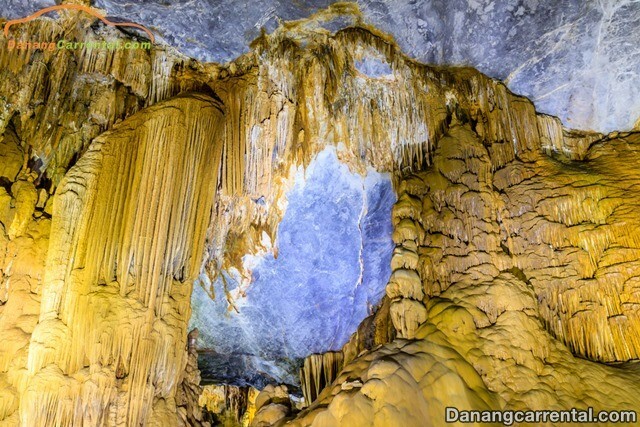 Normally, tourists visiting Phong Nha cave will combine with Hue, Da Nang and Hoi An tour. In which Phong Nha – Hue tour is the most popular. Hue City is about 200 km away from Phong Nha with 4 hours by car. You can visit Hue in one day and then move to Quang Binh to visit the ancient citadel, La Vang holy place, Hien Luong bridge … then continue the journey to visit Phong Nha, Quang Binh. Phong Nha – Hue tourism can help you save your time as well as your own budget because you can visit many different places during this tour. Travel Phong Nha, visitors will have a more general view of the majestic and great nature. Phong Nha Cave belonging to Phong Nha – Ke Bang National Park will be the best adventure in Viet Nam. If you have a chance to go to Quang Binh province, do not forget to travel to Phong Nha. If you are in need of renting Hue tourist car to Phong Nha with the best and most wonderful services, For more specific advice or rent cheap car to visit famous sites in Phong Nha Cave – Quang Binh. Do not forget to contact Kha Tran Car rental via hotline Ms Anna: (+84) 916510201 or Ms Katharine: (+84) 34 797 6789. Wish you and your family a happy journey and many memorable experiences in Viet Nam.